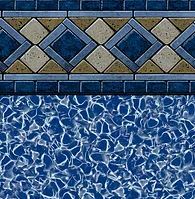 Your inground vinyl liner sets the tone for your entire swimming pool. The colors in the liner will determine the color you see in the pool, setting the ambiance. Swim Shack Inc. will help you craft your unique backyard experience. Below you will see diffent liner categories: Lighter tones will give you the tranquil light blue of the Carribean Islands. Medium is like the look of the ocean front. Darker liners are inspired by the beauty of a lakeside retreat. What inspires you? Take a look at our photo gallery of pools to see how different the water appears in some of the pools. 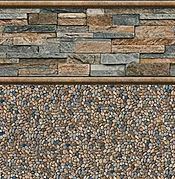 You can choose the edge above the water line to have the look of ceramic tile or even stone. Your inground vinyl liner sets the tone for your entire swimming pool. The colors in the liner will determine the color you see in the pool, setting the ambiance. Swim Shack Inc. will help you craft your unique backyard experience. You can create the tranquil light blue of the Carribean Islands, the look of the ocean front, or even the beauty of a lakeside retreat. What inspires you? Take a look at our photo gallery of pools to see how different the water appears in some of the pools. 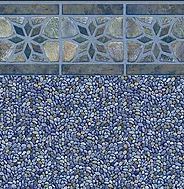 You can choose the edge above the water line to have the look of ceramic tile, mosaics or even stone. 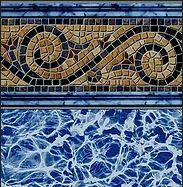 What ever your preference Swim Shack, a Craftworks dealer, encourages you to call (630) 466-4853 to see our extensive collection of pool vinyl liner samples. Curently our supplier offers three diffent color palettes: Reflective, Vivid, and Alluring. Each unique series lets you taylor your backyard to match your personal tastes and prefered color scheme. Each pattern grouping is based on their typical look. Factors affecting the look of vinyl liner patterns include your viewing angle, landscaping and the weather.You can see in the picture above that sunlight, shadows, the change from the wall to the bottom and the ripple on the surface all affect the colors you precieve. Patterns and colors may look different than a picture on the web, when compared to what you see on vinyl samples in person. To choose a vinyl liner pattern for your new inground pool or to enhance your existing pool, call the swimming pool professionals at Swim Shack Inc., featuring Craftworks Swimming Pool Liners, Swim Shack is an authorized dealer. 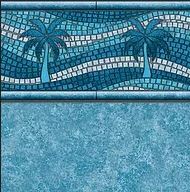 Choose from vinyl pool liner pattern combinations ranging from soft pastels to opulent jewel tones. Scroll down for pattern information. 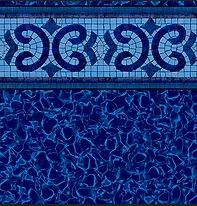 Call (630) 466-4853 to see pool liner samples. Click here to find out more about the pool liner replacement process and Swim Shack's Vinyl Liner Replacement Service. The color and pattern of your liner determines the color of your pool. You can see some of the popular liners in Swim Shack pools on our Swim Shack Pool Pictures page. The colors may appear differently in the water. Craftworks liners range from Reflective to Vivid to Alluring. 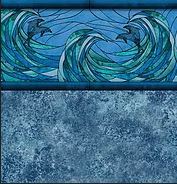 See Swim Shack Inc. for liner samples and details on the 5 year non-prorated warranty. 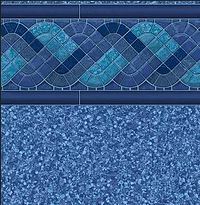 You can see the Craftworks vinyl pool liners on the products page. 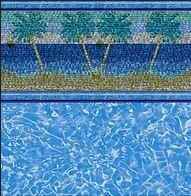 Swim Shack Inc. offers Craftworks vinyl swimming pool liners. Craftworks offers a 5 year non-prorated warranty. Talk to Swim Shack Inc., your authorized Craftworks dealer for more details on the warranty including a 25 year pro-rated warranty covering defects in material or manufacturing. You can see some of the popular liners in Swim Shack pools, in our pool picture photo gallery. You can also see more liners in the water on our pages showing pool water features and pool stair entries. Swim Shack serves northern Illinois in the Fox valley area and far western suburbs of Chicago including: Aurora, Il; North Aurora, IL; Batavia, IL; Geneva, IL; St. Charles, IL and other communities along the Fox River. We also serve Montgomery, IL; Oswego, IL; Yorkville, IL; Bristol, IL; West Chicago, IL; Naperville, IL; Plainfield, IL; Burlington, IL; Hampshire, IL; Hinckly Big Rock, IL; Sandwich, IL; Somonauk, IL and many other towns in the area. Located in Sugar Grove, Illinois, just west of Aurora, we provide custom inground swimming pools, replacement vinyl pool liners, pool chemicals and pool services.